Today, I experienced, first hand, a warp in the space-time continuum. The world turned just a little bit faster this morning. I'm certain of it. I arrived on site just before 9am. There was a bit of sunshine, no breeze and no sign of rain. Almost perfect. 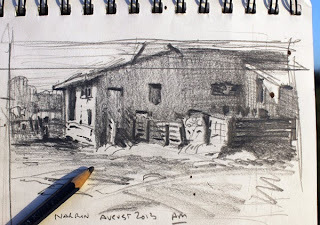 I took a photo and did a thumbnail sketch of a shearing shed lit by the morning sun. I composed it using a brand new, handy dandy adjustable viewfinder that I made last weekend. I'll show it to you one day. By the time I'd finished the sketch, the sun had disappeared behind heavy cloud. I pondered my predicament for almost half an hour. Would the sun return? Did I have enough information in my thumbnail to proceed without the sun? Should I let this one go and just do some scouting around for future subjects? My thumbnail was fairly detailed. It showed the critical highlights and shadows. I had the subject in front of me, albeit in full shadow, so all I'd need to do is to work out what colour the sunlit areas should be. I decided to have a go. Since this was going to be enough of a challenge already, I opted for an "earthy" three-colour palette – ultramarine, burnt sienna and cadmium yellow deep. The burnt sienna would ensure shadow areas tended toward grey-brown rather than purple, and the cad yellow deep would give me all the warmth I needed in the sunlit areas. This selection also ensured the greens would not be too luminous as both ultramarine blue and cad yellow deep lean toward red, the complement of true green. Plein air painting. 40x25cm oil on board. 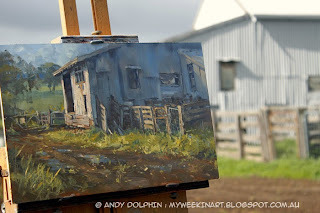 Those angled cast shadows, on the fence and the right-hand part of the shed, were derived straight from the thumbnail. Neither was still in that position when the sun did eventually break through. Interestingly, the scene didn't look as appealing with those shadows cast at different angles. Since I was being "creative" I invented a couple of puddles too. The highlights in the driveway mud were created by wiping back the dark brown paint exposing some of the burnt sienna under-painting. By the time I packed up, it was about 11:30am. Or so I assumed. In fact, when I got back in the car to drive home, it was after 1pm. I'd been here for over four hours! I know I slow down when the clouds roll in but four hours? Ouch! Definitely something going on with that space-time continuum thing. But at least it didn't rain. I like it very much. My granddad lived on a farm and this could well be one of his buildings. The puddles was a great idea and I love the detail on the gate. I'm pretty pleased with it. The puddles were a last minute decision. I have seen it much wetter than this recently - and when it's wet, it's incredibly slippy and it's not so much soil as sheep droppings. I tread very carefully when it's wet. I thought about titling it "Two Gates" as that's what first attracted my attention. But there's two more gates down the end of the driveway and "Four Gates" isn't as appealing. Do you exhibit? I am no connoisseur, but I do know what like. 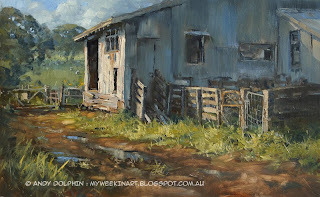 And I got a thing for shearing sheds and western rural landscapes. I have an exhibition coming up in a few weeks at West Cape Howe Winery in Mount Barker, WA (my home town). If you're in this neck of the woods, I'd be happy to say hello at the opening night meet and greet. This painting will be there. Cheers Andy.....I would if I could, but being a lethargic creature.....I know Mt Barker well, I grew up down the road (up the road?) at Tambellup. I am captured by the evocation of the work. I really like it.